Electronic resources created as part of a prototype UF Institutional Repository and Faculty Papers project by the University of Florida. distinct components: a cropping system which is maintained primarily for the consption of the farm household and a livestock system which is maintained primarily for sale. The predominant cropping system is a corn and pigeon pea system. there may or may not be other components. The comnest of these other components are sweet potatoes and cassava, bonavist beans, lima beans, peanuts, cucurbits and okra. These subsidiary intercrops are often planted sporadically over the field often at low densities. found on many holdings usually within the yard or fenced-in. Tree crops. are found in yards, in pastures or along pasture fence lines. Only a few farmers cultivate vegetables for sale in the local market. and swine which are reared for home consumption and for sale within Carriacou; and ruminants which are reared for export to Grenada and 2rinidad. if nothing else, at least corn and pigeon peas. Presumably every single family also has relatives living abroad. These relatives send reuzzr remittances which have become an integral part of the household's income and expenditure. The farm family is the decision making unit linking the unit of production and the unit of consumption: it allocates two factors of production (land (and Zabour) to three processes (crop, livestock and off-farm enterprises). Farn income is generated primarily from the sale of livestock. The farm family is also dependent on remittances. The income that is generated by the farm family is--. very seldom used for the development of the farming system itself. Instead it is used to purchase food and items of conspicuous consxnption. The island of Carriacou forms part of the independent state of Grenada. This outlying dependency has for a long time not been brought into line with developments occurring in agriculture in the region. In an effort to present a state of the art as far as agricultural development is concerned, it was thought that the speediest and most economic way to achieve this was to mount a reconnaissance survey of the island. This it was hoped would provide initial insights into the inter-relationships that exist within the agricultural milieu and the opportunities for agricultural development. This reconnaissance survey of Carriacou was carried out between August 18 and 25, 1984. The direct purpose was to obtain as much information on the farming systems of Carriacou to inform the planning of a Farming Systems Research and Development (FSR/D) Programme of On-farm and supportive research activities. and well being of the farming community. The survey team gathered information primarily by observations and interviews. The team observed inter alia major soil characteristics, climatic indicators, major crop and cropping patterns and methods of cultivation, livestock types and methods of rearing. In addition the team conducted interviews with persons involved in both the farming and nonfarming activities. Interviews were held with farmers, community leaders, local historians, taxi-drivers, agricultural officers, government officials and others. The team also made use of available secondary sources of data such as Aand Use Surveys. The product that follows is therefore a result of an informal survey. west to north-east and 4 km wide, with a total area of 33.7 km Politically, Carriacou is part of the independent state of Grenada. Together with the neighbouring and much smaller island of Petit Martinique, it is administered by a Commissioner resident in Carriacou. Hillsborough is the largest town and capital of Carriacou. The population is estimated at about 7,000, but no reliable census data are available. Many Carriacouans live overseas, mainly in the U.K. and U.S.A.
Carriacou has a semi-arid climate. Temperatures average about 32 C, the relative humidity ranges from 60-80%, and the average annual rainfall is about 1050 mm. Most of this falls during June to November, and the December to May period is usually very dry. There are also short occasional dry periods during the rainy season. Apparently there are no exact reliable long-term rainfall records. The island appears to be a single agro-ecological zone, although there is some evidence that the Craigston and Harvey Vale areas (Pig. 1) are rather drier than other parts of the island. There appear also to be a few small rain-shadow areas in the vicinity of the highest hills. Carriacou comprises a series of hills and ridges and spurs with a number of lowlying gently sloping broad valleys, such as those around Hillsborough, Dumnzes, Dover and Limlair, Brunswick and Harvey Vale. There are two high points almost equal in height at High North (955 ft or 291.1 m) and Chapeau Carre or High South (954 ft or 290.8 m). A ridge runs nortl- outh sloping steeply on the western side, above Hillaborough, but more gently on the other (Fig. 1). andesite ashes, with some agglomerates and andesitic lava, which is coated with a thin limestone layer in the north-east. Small outcrops of limestone occur in isolated patches along the coast. There are no true alluvia, but the slopes of the steeper ridges are overlain by ashy or limestone-derived colluvial materials (Vernon et al., 1959). plus mangroves, beaches and salinas. The numbers in parenthesis are those used in the soil survey (Vernon et al., 1959). T.; ,burn clay foams are well to excessively drained shallow soils over ash and agglomerate. They are found over much of the island, usually in large tracts, and often on slopes of 20 30 and over. Erosion is often severe. The stony and bouldery phase is dominant in the north of the island. The Woburn clay loams are considered suitable for cultivation on slopes up to 200: Lheir major limitations is the shallowness. On steeper Slopes cultivation is marginal and the danger of erosion increases. Limlair clay is found mainly in the Limlair area in the north-east of the island but occurs also around the soutb-west of Dumfries, around Harveyvale, and inland and to the west of Hillsborough. It is a heavy colluvial soil, moderately drained, and suitable for cultivation, except in those (small) areas where it occurs on slopes of more than 100. It is heavy to work and sticky when wet. Betish clay loam is a shallow grey soil over soft limestone with good to excessive drainage. Apart from a few small pockets and a larger area near Sabizan it is found in association with TopHill stony clay in a large tract to the north and north-west of TopHill. Betish clay loam is droughty and suffers severe erosion under cultivation, so is unsuitable for cultivation of any sort on steeper slopes. TopHill stony clay is a shallow brown soil overlying hard limestone. It is found in association with Betish clay loam. Its drainage is good to excessive and it is unsuitable for cultivation: it is invariably found on steep slopes and is severely eroded. Perseverance clay is a heavy brown or black soil, with poor to moderate drainage. It occurs in generally small isolated pockets in the Grand Bay, south of Bay A l'eau, near L'Eaterre and south of Bogles. It generally occurs on gentle slopes, shows little erosion and is suitable for cultivation on such slopes, but the drainage may make it difficult to work and it may lay wet. Less than a quarter of the land area of Carriacou has slopes of 100 or less! The same authors estimate the area with no limitation or only moderate limitation with erosion as the main hazard at 565 ha. or less than 20% cf the total area. including Acacia spp. and Opuntia spp. The gentle lower slopes and some of the higher and steeper slopes are also cultivated or in poor pasture. There is clear evidence of erosion on both lands now cultivated and those under ruinate pasture. this -(910 ha)is forest reserve, hill tops and ridges, coastal mangrove swampL. ravines and gullies, playing fields and cemetries (Anon, 1972). About 1210 ha comprise poor and badly eroded lands, mainly in scrub and ruinate pasture. Of the remaining 1250 ha, it is estimated that less than a half (about 500 ha)is presently under cultivation for crop production: the remainder is tumble-down or ruinate pasture. Erosion both by wind and water is severe. Very few farmers cultivating sloping land practiee any soil conservation, though there are remnants of old Vetiver (Khus-khus) bunids. Overgrazing has resulted in soil slippage and in many instances inVa3cnrby Acacia spp; Opuntia spp. and other thorny plants. century sugar (and rum), cotton, coffee, cocoa and indigo were produced for export. Sugarcane was grown on estates of which the largest were Craigston, Limlair and Grand Bay. Cotton was grown by small farmers, or peasants, and for long remained the major crop of Carriacou : indeed it faded away as recently as the early 1980's. Sugarcane went out of production in about 1928, and was replaced by limes, for the production of lime oil and lime juice concentrate. There were several lime estates Craigaton, Dumfries and Sabazon, for example, but the crop was also grown by many small farmers. The trees were badly hit by Hurricane Janet in the 1955 and production declined. Poor prices for lime oil and other products and low yields due to poor crop husbandry (e.g. no fertilizer use and no pest and disease control) led inevitably to Carriacou going out of production. Cotton remained however, -The varieties grown were "Marie Galante"
and "Antilles" : both have a slightly shorter staple than Sea Island Cotton. The crop was traditionally intercropped with corn and pigeon peas. All the work was done by hand and few purchased inputs were used. There were several ginneries. Poor prices for cotton, and a lack of labour (consequent on migration), led to a decline in production and its recent demise. Cotton can still be seen as a weed, and relics of the lime orchards are still evident at Craigston, and at Dumfries, for example. The most widely grown crops in Carriacou (at the time of writing) are corn and pigeon peas, almost invariably grown as a mixture. About 350 ha are planted to these crops annually, largely for home consumption. The "gardens" are small and scattered so that estimates of area vary. An aerialphoto-survey, carried out during dry season of 1982 estimated the area at only 32 ha, but to this must be added an area of grazing lands mixed with food crops, estimated at 30% of 550 ha or 167 ha, giving about 200 ha. Another method of estimation is to assume a population of 7000 or 1400 households. If all but 10% of these have an average of 0.4 ha of garden, then a figure of 504 ha is derived. Corn yields are estimated at 800 to 1100 kg ha-1 (Anon.1972). are invariably grown as mixed crops, but planting patterns vary. corn/pigeon pea crops. Production has declined for both crops: the imports of sweet potatoes from St. Vincent has apparently discouraged local production. Cassava production, mostly for preparation of farine, but often times used for making "bit" and starch, is also declining. The bitter varieties are the more common but some Tweet cassava is also grown, for cooking. Cassava is usually interplanted in corn and pigeon peas. grazing animals. There are many tamarind, chinese plum, jamaica plum, soursop, sugar-apple and custard-apple trees, but these occur mainly in hedgerows, around dwelling houses and in pastures. Apart from "relic" lime trees there is little citrus. Tamarind are exported to Trinidad, but other fruits may go unreaped and are certainly not exploited commercially. sometimes found as intercrops in corn/pigeon pea systems. Very few farmers grow tomatoes, cabbage, sweet pepper, lettuce, beans, carrots and cucumbers for sale, but most of the vegetables consumed are shipped in from Grenada. include poor past:,.,,.. low nutrition during the dry season and wild dogi. The latter live in the scrubby bush and attack mainly sheep. There are scattered small plantings of Musa spp. especially of bluggoe, but bananas and plantains are also grown. These are usually in small fenced gardens" or around the house. Moko disease is present and bluggoe is unfortunately the most susceptible. The population of Carriacou is estimated to be between 6,000 and 7,000. here is evidence to suggest that although no data are available, that every household has at least one family member overseas. Many households have most of their family members in the 30 to 50 year age group overseas. There is a tradition that Carriacouans overseas send regular remittances back home, and this source of income is very important in meeting household expenses. size of five person (this excludes those living abroad). About 59% of farmers arp female. This preponderance of females may be due to male migration and to the primary occupations of fishing and shipbuilding. About 67% of farmers are part-time and 78% of these reported that faximing waE:,not a significant contributor to household incomes (Campbell & Henry 1982). These latter are often heavily subsidized by remittances. Hillaborough. With the exceptions of L'Esterre, Harvey Vale, Hillsborough and Windward, these villages are dispersed along the road system. Most of the road system is drivable: the exceptions are from Prospect to Petit Carenage in the north-west, and Sabazon to Grand Bay in the south-east. In the interior roads run along the ridges or on top of the spurs. Houses are located on both sides of the road and in some instances are below the level of the road. House plots invariably have a small garden of corn and pigeon peas around the house. Except in Hillsbornugh, there is almost invariably a pig tethered nearby, and there are a number of yard fowls. pattern is nucleated, and the houses tended to be of better quality ccz_ :u-_-" usually of concrete with a galvanized roof. Even the more substantial houses usually have a small garden of corn and pigeon peas in the yard. If housing is used as an indicator of "the quality of life", then the standard of living tends to be higher in coastal communities (e.g. Windwzrd, LIEsterre and Mount Pleasant) than in those in the interior (e.g. Six Roads, La Resouce and Belvedere). Villages along the coast tended to enjoy better facilities such as schools and clinics than those inland. 5 it is a source of employment providing very limited opportunities for arriacou's workforce, especially for school leavers. Carriacou has a remarkably widespread road network, though it is not always in good repairs. Only two stretches are not drivable (see above). There are numerous small tracks and foctpaths leading to homesteads, many of those roughly paved. Several privately owned transport vehicles ply 'for hire on regular routes throughout the island. Hillsbornugh has a central market and a branch of the Marketing and National Import Board (MNIB). Most of the perishable food items fruits and vegetables available in Carriacou are brought in by boat on Wednesdays and on Sundays by the MNIB. The MNIB also brings in ground provisions (dasheen, tannia, eddoe and sweet potato) and rice. formerly they were available only from Grenada. Domestic water is rainwater collected from roofs or small catchment areas in private or public tanks. There are a few ponds for watering animals. In times of severe drought, water is imported from Grenada by boat. ruminant livestock, plus at least one pig and several heads of poultry. The small farm system might also include a small Musa garden, and/or a few tree crops. About six farmers only grow vegetables for sale on the local market, usually as a subsidiary production system to the others. The total area of vegetables in Carriacou probably does not exceed 2 ha. A few farmers may have a very small kitchen garden producing seasonally a few vegetables. These seven production systems will be described and discussed one by one. food for home consumption. Only accasionally is any produce sold. The supply of grain usually may last for a year or two and there are normally no purchased inputs used: the farm family provides labour and the seed. On flatter lands a tractor may be hired to plough, at a supsidiced rate of $30 per hour. Historically, the corn and pigeon peas were interplanted in cotton when the latter was a cash crop and the former were subsistence (food) crops. With the demise of cotton, the system has become one in which corn and pigeon peas are the major and consistent components: there may or may not be other components. The commonest of these other components are sweet potato and cassava, but also observed were bonavist beans (Lab-lab niger), lima beans, peanuts, Vigna app and cucurbits and okras. These subsidiary intercrops are often planted sporadically over the garden, often at low densities (i.e. wide spacings). Some may be volunteers from the previous year. Carriacou farmers are unwilling to remove any useful plant. Examples of the planting patterns observed and measured are given in Figure 2. Append:ix IV Tables I, and II summarise the data and observations made. Corn and pigeon peas may be planted in the same hole (or hill), as in Fig. 2A, or in separate holes or hills, as in Fig. 2B. (Por clarity, the separate holes or hillL of pigeon peas has been referred to as a "clump"). A variant on this latter is to locate the clumps a short distance to the side of the corn hill (Fig. 2C), rather than midway between the rows of corn hills. Another variant is to have pigeon peas both in the corn hills and in clumps, as in Figs. 2D and F, though both these examples include additional intercrops. Fig. 2E shows separate corn hills and pigeon pea clumps with apparently randomly planted sweet potatoes. Fig. 2F shows a system with cassava and sweet potatoes and with an unusually large number of pigeon pea clumps, somewhat haphazardly arranged. The patterns in Fig. 2 are all to scale, and the numbers of corn, pigeon pea plants and other intercrops shown are based on actual counts. Figa. 2 P~anting patterns of corn and pigeon peas in the corn/pigeon pea system. so the plant population per ha can easily be derived. mean plant population of 254 (+ 167.5) and range 102 to 773.
been abandoned One farmer had a small area of cut-back and ratooned pigeon peas, interplanted with corn and volunteer sweet potatoes. Land which has carried several annual crops of corn and pigeon peas occasionally is allowed to tumble down to pastures. * either by design.or because the family can no longer work such a large area. Few farmers plant-pastures. pulled or cut, heaped and burnt. both by wind and by the first heavy rains. Land preparation is normally done in May and June. Older farmers -may start earlier. growth stage .amag.hills, and a consequent spread iniharvest. tentative weed list is given in Appendix 3.
much lower. Pigeon pea clumps were hardly moulded. gardens direct evidence of thinning could be seen. Some farmers feed the corn thinnings to their livestock particularly pigs, but this is far from common practice. Pigeon peas may or may not bc thinned but it is likely that someIself-thinning" occurs in the denser hilzs and clumps. and an insecticide and intended to carry out some control. - Reaping of Corn This begins in September continuing into October. that reaping of dry corn must be protracted, some plants will be ben'. hand or with a grater and stored in 45-gallon oil drums, after a period of sun-drying. Black pepper, freshly ground may be added as an insect repellent. The drums are sealed and corn may be stored for two or more years. The stover may be pushed down to the ground or cut and fed to animals. A few farmers may cut the tops of the plants while still green. for feeding. After reaping the corn there is usually no weeding done nor any other operation. were all in good condition with a minimum of insect damage. for ratooning. One farm had corn and sweet potatoes planted in cutback and ratooned pigeon peas. weeds were about 40-50 cm tall..
just a few farmers who use Sevin insecticide for armywdrm control. from a few fruit trees. weeding and moulding-up and reaping would all require many man days. may well limit the area that can be prepared, planted and cared for. appear to have small ears. these figures do not tally with records of sales made in 1977-78, when nearly 3000 sheep and about 2000 goats were shipped to Trinidad alone. Ruminants constitute the major income source for Carriacou farmers. Animals are shipped live to Trinidad and Grenada and fresh beef and sheep or goat mutton are not easily obtained in Carriacou. slopeC these weeds may perform the valuable function of conserving soil. Cn some lowland pastures, la.ge areas had been invaded by Dativa stramonium (thornapple), a highly toxic plant. Crown lands that zt one time were managed as communal pastures, private lands that are unused and old estate lands that have been abandoned. Farmer gardens on the steeper hillsides are in many instances used as pastures. But for grazing pressure they would probably have reverted to secondary woodland. ratoon or ca7rry over his pigeon peas. Fenced pastures appear little better than the unfenced pastures: there is no attempt at weed control or control of grazing. The only instances o' mprovzd ;~zstrcz observed were at Dumfries and Limlair Agricultural Stations: these were areas of elephant and guinea grass. A nursery area for Leucaena was being established at Dumfries, under the auspices of the National Science and Technology Council. Two farmers at least planned to plant fenced paddocks to improved grasses, one at Dover and one south of Windward. Pastuze resources the-n are poor. Overgrazing discourages or eliminates the more productive species and leads to soil erosion and the invasion of weeds and 1-la i*y instacos of soil slippage were seen on sloping lands. The typical .nagemcnt of ruminants is as follows. From June ti:rough February they are normally tethered on communal grazing lands, old gardens, roadsidcz or on private pastures. Even in fences pastures sheep and goats were often tethered, presumably for ease of control. Water is carried to the animals once a day unless they are to be taken home at night. Some animals are not taken at night but -are moved daily to a new area. From February or March, many animals are "let go" : this is the "leggo" season. The start of the leggo season varies from place to place in the island, and depends on the amount of forage available, and on the far-mers' forage resources. Farmers with fenced pastures may not let their animals go er may delay this until their forage resources make it necessary. A few farmers use cut-and-carry to feed their animals duringg the beginning of the "leggo" season, but with depletion of forage resources they usually have to eventually let them go. Animals wander far and wide in search of forage. Cattle and sheep may return home at night, especially if they are watered at a particular time. But many farmers would not see their animals, especially goats for many months. Inevitably the animals lose condition : the quantity and quality of the forage available progressi.ely declines. Animals are re-possessed at the start of the rainy season. This is crucial to the corn/pigeon pea system and in many locations means that only a short time is available for land preparation. Animals are sold live year round, but there is a peak in sales towards the end of the dry season, possibly due to a need for cash at this time. suckle. Milk yields would be low, but there is some scope for household use of fresh milk. The supply would be seasonal, and presumably negligible during much of the leggo season. There is a wild goat problem: these live on the uppe slopes of the hills and prevent any reafforestation. One suggestion was the planting of mauby as this is not debarked or browsed by goats, and spreads by root suckers. These wild goats are sometimes caught by driving them into nets. Some farmers lay claim to these goats, so proposals to eradicate them have not been followed up. There are also a few wild .ogs that periodically prey on sheep. number of ponds which were fenced and had a pump to raise water into drinking troughs. These ponds are now unfenced, and animals must go down into the pond to drink resulting in occasional losses. There is a need for more ponds and better watering facilities. veterinary officer but there are two animal health officers. A deworming programme was started using the broad-spectrum dewormer Panacur. This was available at EC$1.00 per dose, but farmers have not continued to practiceregular deworming. There is thought to be a high incidence of coccidiosis, but this needs to be investigated. There was at one time a fencing subsidy, and many gardens and pastures are fenced. There has been little recent fencing done, but a few farmers are embarking on a programme of pasture improvement, and hav te,,Led their paddocks. tethering and buckets for providing water must be purchased. season ar hour or two may be spent moving animals and watering them. for browse, nor is there much "cut and carry"
breed. Pig-keeping is a backyard activity, with the pigs kept in small sties, tethered under a tree or on rough pasture, or penned in a corner of a field. Only occasionally were free ranging pigs observed. There is no serious breeding, but some farmers do produce weaners for sale to others : many farmers keep only one or two pigs at a time to fatten. pigs would pick up fallen fruits, and would dig for insect grubs, roots etc. There is little supplemental feeding, but cracked grains and peas are fed, and many farmers occasionally purchase a little coconut meal imported from Grenada to feed to their pigs. Pigs are not dewormed, and many appear to carry a heavy worm burden. Pig meat is the only meat consistently available as fresh meat in the local market, so some farmers do earn some income from their pigs. The quality of meat is predictably poor : thick back fat and tough lean meat. Farmers killing for the household normally "corn" (i.e. pickle) some of the meat, and may sundry some for storage. Poultry are invariably "creole" fowl,kept on a free-range system and roosting wherever they can. Few eggs are collected and many are doubtless lost to rats. Fdw1S are killed for eating from time to time, but chicks are regularly being hatched :- by broody hens to maintain the flock. As with the pigs, the poultry forage for weed seeds and insects and are fed 'kitchen scraps, cracked grains and farm wastes. There is virtually no trade in local eggs and poultry meat : these items are imported regularly. The Musa gardens are not fertilized, nor do they receive other inputs. Many apparently receive little at'Lention. Bluggoe, plantain and bananas arc important in household diets and are also a minor source of income to some farmers. neglected trees are found in ruinate pasture, and, less commonly overgrown with scrub, especially on the former lime estates of Craigston, Dumfries and Sabazan. Other tree crops include various Annona spp. (soursop, sweetsop or sugar apple and custard apple), tamarind, breadfruit and occasionally mangoes, oranges and grapefruit, Avocadoes are almost totally absent. Many of these trees are found in yards, in pastures or along pasture fencelines. There is little or no trade in these fruits- but some tamarind is exported to Trinidad and they are used mainly in the home. Tree crops receive no real care. One farmer visited had a grape trellis, producing for the local market. group of Rastafarians who aimed to be largely self-sufficient in food, but made an income from sales of some of these vegetables. Other vegetable growers had a much more limited range of vegetables nd operated smaller areas. two vegetables in the yard. production of vegetables, recognising that these would improve family nutrition, and reduce the nced for imports into Carriacou from Grenada. Small grnves are found, mainly on sandy soils above the beaches, along the road from the vtrrort to Hillsborough, and in L'Esterre where corn and pigeon peas are grc"n on sandy soils under coconuts. Elsewhere, only scattered coconut palms are to be found. The palms are old (probably at least 45years old) and the groves were severely thinned by Hurricane Janet in 1955. They are now neglected with an understory of sea-grape, mangrove or scrub. No fertilizer is used and there is little concerted effort to reap fallen nuts. Attempts at replanting have been consistently thwarted by grazing animals during the "leggo" season, when most ruminants are released to browse all over the place. a typical Carriacouan farm household is presented in Figure 3. There are two major categories of socioeconomic determinants: endogenous determinants and exogenous determinants. The former involves the farm household, the factors of production that it controls' and allocates, and its decision making processes as it relates to production and consumption; the latter involves the social milieu in which the farming household, operates i.e. the realm of community structures, norms and beliefs, all of which influence farm decisions. Farm Househb(-.d This is the focus of all decision making. Furthermore, because the Carriacouan farm family tends to be subsistence oriented, the unit of production is also the unit of consumption : Surpluf .food is fed to the livestock or given away to friends and relatives. Food(rice, macaroni, salt, sugarmilk, canned fish and meats, cooking oil) which is not produced within the farm itself is purchased with money from off-farm employment (when available) and more so from remittances and from savings. Every single family in Carriacou owns livestock and cultivates if nOthikag else, at least, corn and pigeon peas. Presumablyvery single family also has relatives living abroad. These relatives send remittances regularly. As such remittances become an integral part of the households' income and expenditure. for the purchase of energy foods. It is also the general opinion of farm useholds that food purchases increase during the dry season the younger generationn do not quite like food prepared from dry corn- at which time the xzportance of remittances becomes even more significant. sector in the United Kingdom now receive a pension. number of instances where the farm household recorded a cash outlay the expenses incurred were that of seed material (primarily for vegetables) and hired labour which is paid both in cash and in food refreshments. f. the time of the first rains. g. the se-.erity of the dry season. corned-pork are also sent to relatives who live abroad. It is therefore very typical for a Carriacouan. family to produce a surplus for storage. There are many families who have corn which was harvested two years ago. Corn more than two years old is used as feed for the yard fowls. however apply to other crops i) which are perishable and cannot therefore be stored and ii) whose production primarily depends on the availability of Planting material. Livestock production is geared first for the market and then for family consumption. Sheep, goats and cattle are reared for sale while poultry and swine are reared for the farm family's meat protein. Only on very rare occasions are the ruminants slaughtered for home consumption and that too usually in August when family members living abroad return for the yearly Regatta. Most families prefer to purchase imported frozen chicken parts, usually the wings and if a pig is slaughtered much of the meat is salted and dried for storage and for sending away to relatives and friends living outside Carriacou. farming systems. The farm family is willing to spend money on its maintenance. During the wet season when the animals are tethered in pastures usually quite away from the homestead*' water is carried to them. Their grazing spots are also changed daily and money is sometimes spent on purchasing vetir-rary medicines. iii) the demand for family consumption. on the savings is computed on the number of surviving newborns and the increase in the size of the herd. Off Farm Employment Agricultural production is seasonal. This coupled with the very unpredictable rains makes off-farm employment.very desirous. Unfortunately employment opportunities in Carriacou are extremely limited. Public sector employment in an island the size of Carriacou is understandably restricted. Whatever employment is available is mostly self generated. The number of small grocery rum liquor stores scattered throughout the island is quite remarkable. These stores usually provide credit facilities. */The animals have to be kept away from all cultivated land. Community Structure: Due to the smallness in size of the community, social integration is very marked. payment in kind, usually by way of food and liquor. Some farmers claimed that such cohesiveness sometimes worked to their detriment, i.e. they were expected to give away the food free than to sell it. On the other hand, because the community is well integrated, it also functions as a sanctioning institution. Nearly every family in Carriacou plants corn and pigeon peas (even if there is sufficient corn and peas stored away)not only because it needs the food but because it does not want to be shamed and accused of being-lazy. i.e. "where were you when the rains came?" communal level is reflected at the family level too. Most households are extended families and span at least three generations. Very close ties are also maintained with those relatives who live abroad. Most farming activities are carried out by the farm family. Other agriculturally related beliefs include those to ward-:off the:.evil spirit, "to stop people talking about the good corn and pigeon peas in the field.' It is generally believed that piercing 3 limes in a stick, inverting a bottle over it and placing the 'charm' in the field will ward away the spirits as will planting aloes amongst the crops. Animal sacrifices are common and form an integral part of the rituals involved in launching a boat. Related rituals are the 'Big Drum' which is of 'Ibo' tradition and which is performed 3t major feasts. the 'Crop Over' was a feast celebrated in October to m~rk the first harvests of the corn. Finally, the Mount Royal and Mount D'or areas are usually identified as areas where 'Shango' (Spirit worship)) is still practised. the National Commercial Bank). The Marketing and National Import Board brings in perishable produce twice a week for sale. There is also a limited amount of sale in the central market in Hillsborough. While on the subject of marketing, mention must be made of the traditional way in which prices are set and of the general attitudes to price setting. Prices are not set according to the laws of supply and demand. Instead the farmer wants a price just less than the retail price at which the commodity is being retailed. Very often the farmer is not willing to reduce the price; he/she would rather give away the produce than to sell it at a price which he/she does not think is fair. Farmers also tend to want to set prices according to the amount of money they need in order to make-6ther purchases. system. It refers to the farm family and its decision making processes. The socioeconomic subsystem and the agro-ecosystems interact to form a farm system which will be described in the following chapter. components: a cropping system which is maintained primarily for the consumption of the farm household, and a livestock system which is maintained primarily for sale. The livestock system is further subdivided into two categories; poultry and swine which are reared for home consumption and for sale within Carriacou, and ruminants which are reared for export to Grenada and, more so, to Trinidad. The interaction between the crop and livestock system is by way of i) utilization of crop residue (corn plants. sweet potato, vines, corn)as livestock feed, and ii)utilization of pen manure as organic manure. Musa spp. with one or more other fruit trees. and tools, etc. or purchase of inputs. weeds, pigeon pea browse, spoilt or unused fruit. -the cost of land is relatively small. non-farm enterprise is also an important source of income. The income that is generated by the farm family is very seldom used for the development of the farming system itself. Instead it is used to:. - purchase items of conspicuous consumption. Figure 5 summarizes an integrated farming system in Carriacou. purchased in, and shipped from, Grenada. packaging corn meal, peas, etc..
where the subsidised Ministry tractor service can be used. vegetables and legumes (other than pigeon peas). suffer early competition from corn. but there are no data on the losses suffered. control (i.e. of the first weeding). - Wild dogs, which prey on sheep. goats militate against any programme of goat Improvement. and extremes in forage production over the year. and poor live weight gains. quality, and low egg production. - Poor nutrition, contributing to poor growth rates,etc..
- High incidence of internal helminth parasiste. other Musa app. followed by a quarantine period is necessary. Note that some such programme is currently under consideration. Lack of water to extend production into the dry season. -* Inability to replant due to lack of fencing and the "leggo"
This Chapter lists a number of interventions or activities that arise directly from the constraints listed in Chapter 5. Not all the constraints are addressed in detail: many are beyond the scope of CARDI's Farming Systems Research and Development (FSR/D) Project. These require action at Governmental level or as discrete projects (e.g. reafforestation, fencing of forest reserves, etc..) or require entrepreneurial action (e.g. marketing, processing, importation of inputs,$ etc.). Others require communal effort from a group of farmers (e.g. watershed protection and damming of water) which may be within the scope of the FSR/D Project, though the Ministry of Agriculture has plans for a watershed project at some time in the future. There are other constraints that are amenable to simple intervention, but where the present system appears to suit the socio-economic environment and the needs of the farm family. For example, the pig and poultry system could be improved by penning the poultry, importing superior breeds (of both pigs and poultry), and improving the nutrition. This does not appear to be justified: the present system is minimal cost and the benefits from improvement would not appear to justify the additional costs (both capital and recurrent) involved in such an intervention. Those activities that should be given priority within CARDI's FSR/D Project are marked with an asterisk. It will be necessary to prioritise these in consultation with the Ministry of Agriculture. row or so ridged rather than moulded would help. impound-ater for livestock and possibly for..rrigation. *out_.can-fUollow only from pasturezimprovm nt-and..Ioage conservation. application and the use of herbicides in land preparation. inducement to fence can be introduced, many other interventions become.ineffective..
- *Fertilizer trials with the local corn and with other (nonhybrid) varieties (i.e. a fertilizer X variety trial). pigeon peas (including separate pure stand plantings). from the present level of control (or no control). demonstrate and quantify the effect of delayed weeding. on fencing., pasture improvement and forage conservation. - *Genetic improvement of sheep. the wet season, and the establishment of protein/energy banks. and in lamb and kid crops. land, and on steeper slopes that should not be cultivated. Other tree crops (e.g. cashew) should also be considered. techniques- especially mulching and fertilizing and manuring. congeniaZ oral historian and observer of the Carriacou scene. bordered on the simpistic or absurd. Campbell, J. and Henry, C., (1982). Final Report on Grenada. Agricultural Census, Ministry of Planning, August 31, 1982. August 18 Carriacou, arriving 10:00 a.m.
& M. Rao) 4:00 p.m. to 6:00 p.m. SUNDAY A.M. K. Buckmire arrives Carriacou from Grenada. August 19 Discussions on approach and progrwamme. August 20 Martinique. Meeting with MOA staff and discussions. 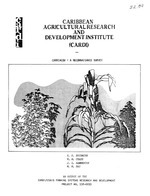 in Agricultural Sub-dictrict 1. TUESDAY A.M. Discussions with Land Evaluation Officer. August 21 A.M. Farn visits in southern part of Agricultural SubP.M. disctict 1. P.M. Discussions with Mr. V. Bullen. P.M. K. Buckmire leaves for Grenada. SATURDAY A.M. J. HiRerton and V. Chase leave for St. Lucia. August 25 P.M. M. Rao leaves for Grenada. There are twenty-two (22) watersheds in Carriacou, seven in sub-district 1; nine in sub-district 2 and six in sub-district 3.
have been identified for an improvement project. Dumfries is the largest with an area of 290 ha.. These nine watersheds identified are either cleared eroded lands, or under poor thorny scrub with cactus and poor pastures. The soils found in these watersheds are wobrun clay loam on the upper slopes and Limlair clay in the lower parts. 1. Weeds of cultivated land, majak in corn and pigeon pSas. Unidentified: a cZimbing, viny Zegume. PZus many other woody, scrubby species, other cacti and a shrub with miZky sap. (Euphorbiaceae?). including information on livestock, slope fencing, etc. Brunswick T S 30 N H.B 15 1 pig 8 sheep. Lauriston T V 75 N B 5 B (PN, SW) ? Sheep ? Pigs. Mt. Pleasant H V/T 60 N H 10 H,B LI? OK Cotton as weed. (Xa18ton T V751N B <5 -.1500 slope. ____ ___ ___ ___ ___ __ ___ ___ ___ ___ ___ ___ ___ ___ ___ ___ ___ Veltiver bunds. Bogles V 90 E H, B 5 B (SW) ? cattle. ? sheep. (Alexander) Problem of i-ld dogs. 3% of plants damaged: N = non-economic, E = economic level of damage (i.e. requiring control). 4H = in-hill (with corn), B = between corn rows (i.e. in clumps) 60Other crop species: CU = cucumber, CX = cassava, DO = 7Edolichos beans, LI = lima beans OK = okra. PN = peanuts, PV = pumpkin, SW'= sweet potato, V14 = watermelon, Brackets ( indicate a thin, irregular stand, possibly volunteer. 52 = Betish clay loam. (2) PH determined by the Kelway Soil pHD Plus.